It is rare that you always have the date and time in mind to follow up with your unresponsive prospects. If you swear to remember ALWAYS, rest assured you are in the minority. For the majority, marketers cannot help but miss out on unresponsive prospects because they have to set up reminders to follow-up every single time. These missed opportunities can have severe impacts on your marketing ROI unless you already know the solution to this problem!! 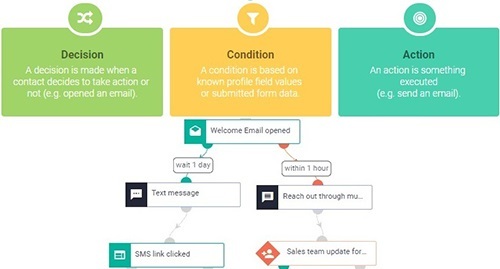 Yes, Drip email campaigns can help you be on time with the right kind of email content so that your unresponsive prospects start engaging again. Infact, drip emails can keep your subscribers and customers engaged, thereby reducing the chances of your subscribers going silent after a while. Even if that happens sometime, you have the re-engagement drip campaigns at your rescue. When do you start implementing a drip campaign? This is one question I often hear fellow marketers ask. At EasySendy Drip, we believe drip emails start immediately after your visitor submits your email subscription form to either join your newsletter email list or to download an interesting content asset or maybe to become an early subscriber to an upcoming event. What you need to start at is to understand the various triggers that can help you create a befitting drip series. Like this, you can create various drip sequences. Some common drip emails are welcome drips, onboarding drips, autoresponders, promotional drips, feedback drips, educational drips, and more. You can check out these handpicked drip email templates that always work for small businesses to get started. Also, here is a quick guide to drip email marketing, covering all the basics for you. In this article, I will show you how brands are amazing using drip emails to nurture and engage their subscribers. It is not just a saying that drip emails do wonders. I have compiled 3 amazing drip examples that will make you want to build a drip email campaign right away. And when you do so, start with EasySendy Drip for free. Recently, I had signed back on Netflix and this time, I went for a premium membership. To my delight, Netflix did not forget that this is my second sign up after I had deleted my free account last time. And their welcome email couldn’t be better. Take a look at their subject line (which evokes a feeling of rekindling lost bonds). Another awesome welcome and onboarding combo drip campaign is this email from Indian ticketing partner brand, BookMyShow. BookMyShow recently launched a Superstar program for its users, to which I happily joined (credits to the amazing features it promises). The welcome email is a combination of a warmth and a quick guide to get you onboard. Needless to say, the email looks amazing and it is hard not to engage to such a cute email. No other brands do drip email marketing better than this global eCommerce Giant, Amazon. When it comes to behaviour-based email drips, Amazon is on-point with their emails. For instance, last day I was browsing bags for my DSLR. Today I woke up to this email (below). The featured product is exactly what I was looking for and also fits well with the budget I had set. Also, my choice of bag was available when I was browsing. Now, Amazon does its bit to search up a product much similar to my choices (and interests) that is available for delivery. Since I need this bag, I have already added to the cart. Let’s say I wasn’t intending to buy this and was browsing just like that. However, Amazon has my browsing patterns notes – my browsing patterns have suggested that I own a DSLR and might buy a bag sometime sooner or later. If I am not engaging with any DSLR bags in future, Amazon will stop sending me recommendations. If I keep looking for products in this category, chances are that I will buy at some point of time. Why this worked: Amazon’s drip emails are intelligently crafted. They are automatic but are highly relevant. It is evident that multiple conditions and decisional triggers that function together. Ofcourse, we are talking about the eCommerce king here. They have powerful drips functioning across various lead profiling features and factors. Yet, it is always inspiring to look at how behaviour-based emails can evoke long-term customer loyalty and engagement. Subscriber engagement is all about educating your subscribers. Hence, educational drips have the most impact when it comes to improving email campaign performances or triggering more conversion rates. Each subscriber has various lifecycle stages and at each stage it requires different educational materials to activate to the next stage. To ensure this activation is not pushed or forced, educational drip campaign can smooth out the process. And who will know it better than Content Guru Neil Patel, founder of Quick Sprout blog. This image does not showcase the entire email content. Why this worked: To be honest, there is nothing fancy about this email. Quick Sprout literally puts their entire blog post in the email including all the images they have used in that article. Despite people stating that long-form emails never work, I wish to say otherwise. You see, what Quick Sprout does is, it hands out the entire resource to you over your email without needing you to open a new browser and go to their blog to read their amazing content. Most of their contents are based on handy resources, tips, tricks, and case studies – things that as a marketer I will always want to know. Having to shift to a new browser or tab may put the reading on-hold. So with Quick Sprout, I have the entire resource right in my inbox (which I love). For me this is a great way to keep me hooked. If you have not yet built a drip campaign, try it on EasySendy Drip. We have amazing ready-to-use templates, intuitive drag and drop email builder, and advanced email tags to get you started. Infact, since we are a fully GDPR-compliant brand, we encourage our subscribers and customers to use our embeddable forms to build a genuine email list before they start with drip emails. PS: Don’t forget to A/B test your emails. Sreeju is a Marketing Content Writer at EasySendy. She is Email Marketing Enthusiast. She holds a degree in Electrical and Electronics Engineering and she likes travelling, reading books and research data on internet. Thanks a lot for writing about the excellent drip campaign examples. It is a great guide to get started with. Excellent piece of information with in-depth analysis to drip campaign examples. I admire the efforts you have put in collecting data for writing it.